A few weeks ago, readers of Sue Kennedy’s blog were offered a chance to participate in her enameled rondelle bead challenge. She randomly drew 5 names from the list of respondents and guess who was one of the ones to be chosen? Sue sent beads to each of us and we had about 3 weeks to come up with a design. This is my first blog hop and challenge. I thought it would be easier than it was. I thought about it a lot and then decided to make earrings. I’m surprised I didn’t wear out the enamel on the beads with all of my attempts to put something together and then take it apart when I changed my mind! 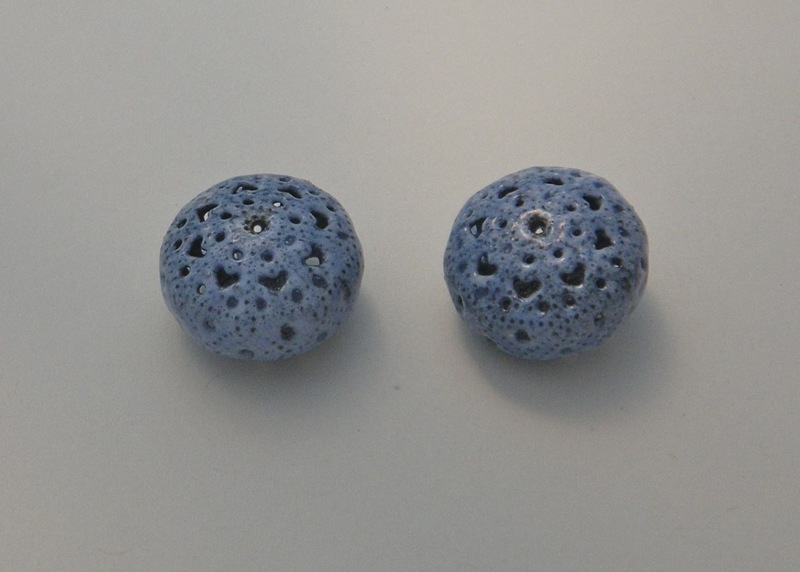 I finally settled on making this mix of dangles to hang from the beads. The pattern on the beads is so delicate, I did not want to create anything that would cause a distraction by being too heavy, visually. I hammered and drilled pieces of 20 gauge Argentium sterling for the silver dangles. 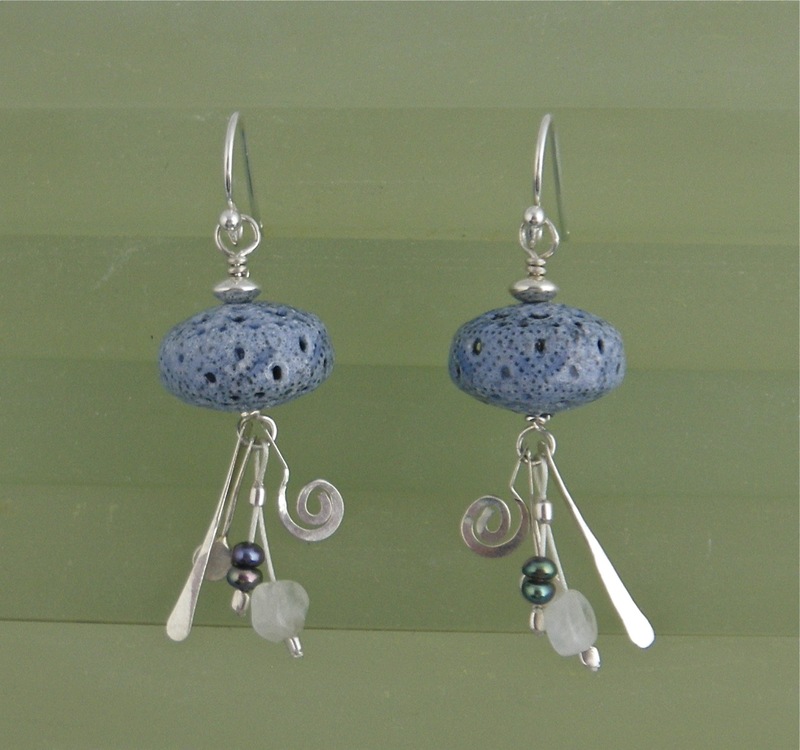 I added tiny freshwater pearls and small labradorite beads at opposite ends of silver plated Beadalon. In the right light, the labradorite has a wink of blue that is close to the color of the enamel. Please be sure to click on the links below to see the excellent work by the other challenge participants. (That is the “blog hop” part.) Thanks for the opportunity, Sue. This was fun! They are just lovely Barb. So delicate and that color is beautiful. I have never done a blog hop before either. Sometime I will have to give it a try. Thanks Roberta. I love the color of the beads that Sue sent. 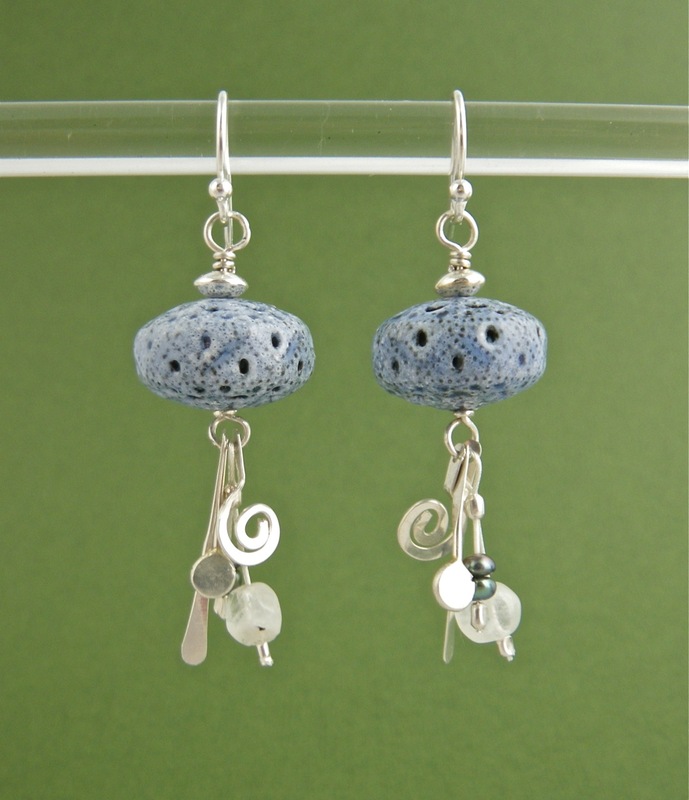 I am usually drawn to greens, so I had to really think about what I would pair with this delicate periwinkle color. It was fun to do, and a good distraction from a zooey week. Darling earrings! I love the little dangles. These are perfect for summer! Love them, Barb! Your dangles are so great, I love the color mix! Thanks so much for doing the blog hop! Thanks so much for the beads and for including me. It was fun! Barb, these are beautiful! I am so impressed with your skill and craft. Thanks Ruth! I love reading all the classmate updates you are posting on FB. Love the dangles and love your beads with silver!! Beautiful work!! Oh, Barb, these are lovely earrings! Flirty and fun and full of movement! These earrings are so beautiful and so creatively different! Just lovely! L.O.V.E. especially that quirky little piece of folded-over beadalon…. Thanks Miss Erin! It was fun to be in this with you. These are beautiful!! Congrats on being chosen and sharing your lovely earrings with us!! Thanks for checking them out Sharon! I really love these, Barb, and have two daughters who would fight over them! Gorgeous work! Do you have to guard your own earrings from your two daughters? Or is it like having an even fuller jewelry wardrobe because they share theirs with you? As a mother of two sons, I don’t get to find out! Barb, I really love yours. The colors are perfect. I also like Holly’s. I can think of people I would like to give them to, but I would have to be very unselfish to do it! Hi Cheryl, Thanks for checking them out. Hey, nice coverage of all of your photos about getting Skylands ready for the season! So many blogs to keep up with…. Hi Barb! Isn’t it funny how much pressure you can feel about a project like this? Haaaaaaa I loooooove the way you lightened the bead with those dainty, pretty dangles. I look forward to getting to know you and your work better! You know it Jen. I felt really pressured, and it surprised me. I look forward to getting to know you and your work better too.! I love your dangles! At one time or another, I’ve done earrings with a similar type of every dangle, but never once thought to put them all together as you have done here. It looks absolutely fantastic and so creative! What a great design and beautifully executed! Thank you Sharyl! I loved going to your blog and seeing all the emphasis on color. I learn so much from what others are posting! Love them! We just came from an afternoon at the National Aquarium and your earrings remind me of the incredible sea life we saw! Thanks Elisabeth. They also made me think of some kind of jelly fish!